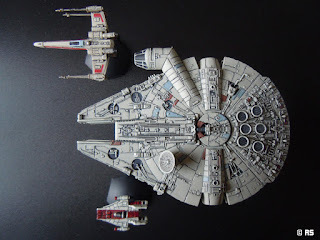 X-Wing has rekindled my interest in Star Wars fighter combat in a major way so I pulled the Revell Easy Kit Pocket Millennium Falcon from my stash of kits and gave it a coat of paint. This model is in fact pretty good and packed with detail (admitedly at least half of it made up but we're hardly dealing with studio scale here) and paints up a treat. There are some obvious flaws such as the fact that the fact that the cockpit is slightly too far from the fuselage but the overall shape is good. The fact that it is supposedly prepainted is probably its biggest handicap because the "prepainting" is merely grey plastic with a couple of coloured panels. 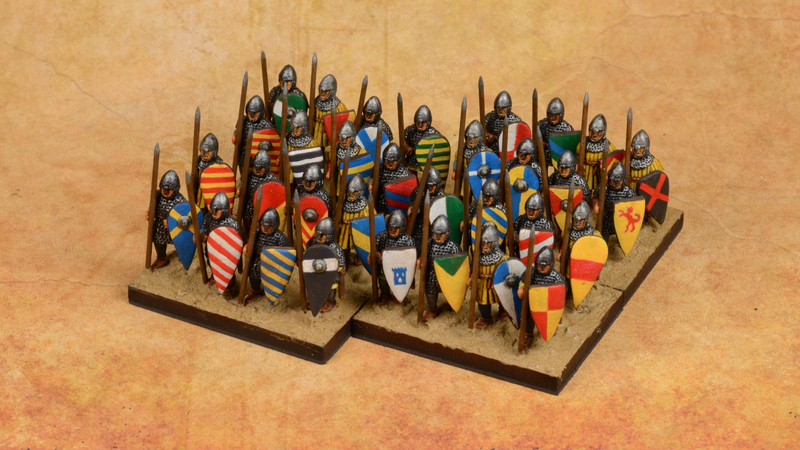 Which is fine if you think that the old Matchbox kits that were made in two-tone plastic were also prepainted. The number of pieces (18) is pretty low and the fit is quite adequate. Being a snap-fit kit (although gluing is recommended) also makes it easy to keep the top and bottom separate until painting has been completed. The model can be improved by a simple wash of ink but I thought I'd give it the whole treatment (hey, I'm a modeller at heart and enjoy this at least as much as playing). 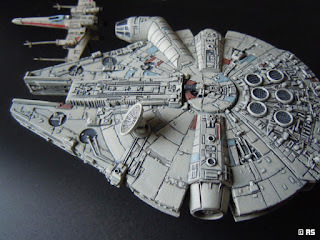 The Falcon was first given an overall basecoat of Vallejo deck tan followed by a heavy black wash and a drybrush of deck tan. The panels were then cleaned up with the base paint and highlited with a mix of ivory and deck tan. Rust and blue grey was then used to pick out some panels. I didn't bother with weathering because it is all too easy to overdo on such a small model. 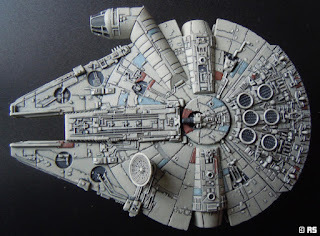 Once painted, this model definitely stands the comparison with the FFG models. Which brings us to the entertaining question of scale. 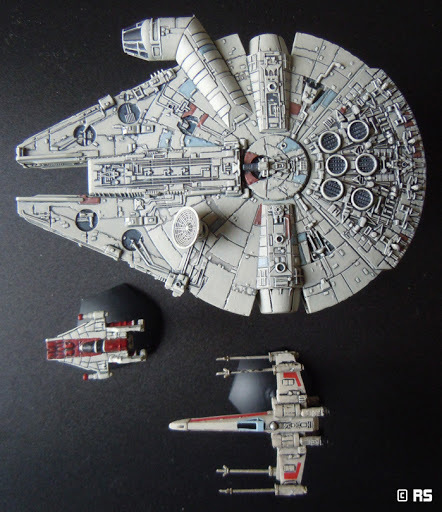 The Model is 11 cm long and according to Revell it is 1/240 scale which has to be wrong since FFG's model is about 12.5 cm at 1/270. Unless of course both are using different "official" values. 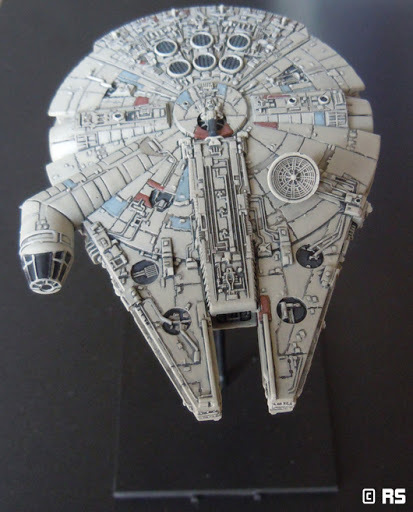 Which is in fact the case since Revell uses the original "official" length of 27 m and FFG the revised "official" length of slightly under 35 m. Of course, the figure of 35 m was arrived at mostly to reconcile the Tardis-like differences between the interior volume shown on-screen and the external dimensions. 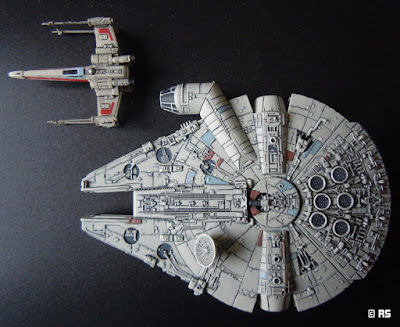 If you are into Paracetamol-sponsored debates, I recommend Robert Brown's Ship of riddle page for a thorough rundown on the various estimates of the Falcon's size(s). Basically, if the model portrays a 35 m Falcon, it is 1/316 scale and if it is the same scale as the FFG models it would make the Falcon 29.7 m which is well within the various estimates. In any case, the width of the cockpit (which is the only real point of reference) is that of a B-29 bomber at 1/270 which makes it the correct size for the known crew. All in all, the Revell kit is a more than acceptable proxy for the forthcoming FFG model. And at 2/3rd of the price of a TIE fighter expansion, it is a very good deal. And if the size bothers you, you can always say it is in fact a fictional YT-1260, which is to the YT-1300 what the DC-2 was to the DC-3. Oh, and just in case you want to see how someone with a lot of dedication and time really brings out the best of this kit, head on over to the RPF forum.